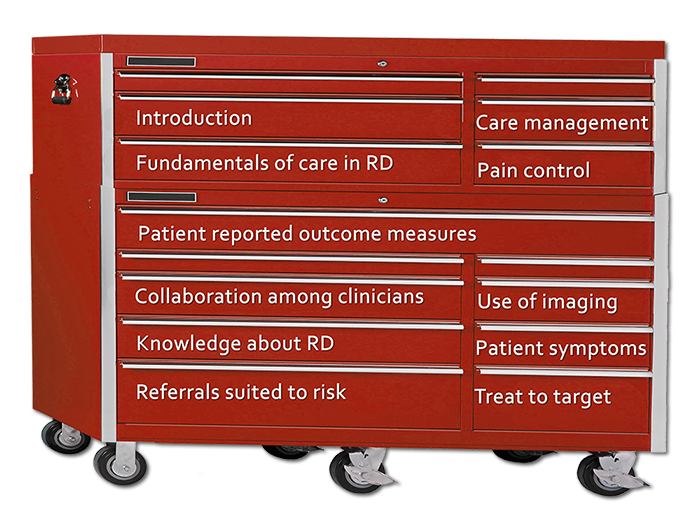 Mouse over the labels on the Tool Chest below to see topics important in health care for people with Rheumatoid Disease (RD) / Rheumatoid Arthritis (RA). Click to read each section of the toolbox. Clicking the small red toolbox takes you to an index of topics. The purpose of this toolbox is to provide healthcare professionals with a better understanding of the medical needs of PRD. This resource will reference professional guidelines, expert recommendations, and patient feedback about the treatment of PRD. As current research is expanding knowledge about RD, there is a need for both patients and healthcare professionals to be up-to-date. Please check back as these pages are updated or expanded. Rheumatoid Disease (RD) or Rheumatoid Arthritis (RA) is a systemic immune-mediated disease that can affect any part of the body. In RD, excess immune activity causes inflammation that usually leads to fatigue, fever, stiffness, or a feeling of being ill. Typically, RD attacks the musculoskeletal system, causing joints or tendons to become painful, swollen, or weak, and leading to disability or permanent damage. The disease can also lead to problems with various organs or systems, including the circulatory or nervous systems, eyes, skin, bones, heart, or lungs. Click here to read more information about RD. Like patients with other complex chronic diseases such as Type 1 Diabetes, persons living with Rheumatoid Disease (PRD) often require regular care or continuing support from medical professionals. This often necessitates consultation with various medical specialists and use of multiple prescription medications. The complexity of RD and a lack of familiarity in the medical community with its comprehensive nature contribute to the immense challenge of treating RD. 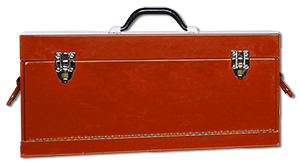 This tool includes 10 ways to provide good care for PRD listed on the tool chest, plus several other sections listed in the box below. RD can affect many different aspects of a patient’s health and carries several serious health risks. The disease can affect vital organs in several ways and its systemic inflammatory nature is a burden on a patient’s health generally. Also, PRD are more likely to experience several co-morbid conditions. It has been known since at least the year 2003 that PRD do not receive optimal health maintenance or adequate preventive care services. Actually, PRD tend to receive preventive care or risk management even less frequently than the general population or those with other chronic diseases for various reasons. [3, 4] The American College of Rheumatology has published a position statement which supports rheumatologists as principle care physicians for people with rheumatic diseases. While a shortage of such specialists makes that unlikely, it indicates the nature of the responsibility a rheumatology specialist has in assisting PRD to obtain adequate attention for RD. One key factor to obtaining appropriate care is to maintain a problem list. A problem list must be maintained for PRD because they are likely to have multiple, chronic, complex health issues. If you are not doing so, ask who is managing care for this person or maintaining a complete problem list in order to determine whether at least the minimum level of care is being performed. If no one has created a problem list, assist the patient in doing so. Most RD symptoms are what patients call “invisible,” having no visible evidence that others can readily detect. In light of what is now known about Rheumatoid disease activity distinguished by imaging (see #7 Imaging) and the ongoing damage related to it, patient reports of Rheumatoid Disease-related pain should be given credence. Rheumatoid Disease is well known to cause intense radiating pain. In spite of disease treatment, about three-fourths of PRD still survive on daily doses of anti-inflammatory medicines and pain medications. In a large survey, 68% of PRD reported having zero pain-free days each month, 31% reported moderate to severe pain at least 15 days in an average month, and on average, they experienced only two pain-free days per month. Disease-related pain must be adequately addressed in conjunction with disease care. If for some reason, you are unable to provide satisfactory pain care, you should assist patients in finding that care from another professional. Use patient-reported outcome measures (PRO’s) to help gauge disease activity, specific disease-related problems, and disease impact on a patient’s life overall. Patient reported outcomes help reduce discrepancies between patient and clinician estimation of disease activity. Data generated from patient self-reports is often more accurate and complete, making it a useful tool to bridge a communication gap. In spite of a large body of research demonstrating the value of PRO’s in rheumatology care, only about 20% of those providing usual rheumatology care incorporate PRO’s into patient care. PRO’s are sometimes administered merely to satisfy a directive set by a payer or a governing body. However, if PRO’s are administered, but not properly utilized, they will not improve care and communication. PRO’s can be administered in the waiting room and scored in less than a minute. It is crucial that you facilitate cooperation between your practice and other physicians. People with Rheumatoid Disease (PRD) will likely need the advice of several physicians including a general physician, an ophthalmologist, a podiatrist, a physical therapist, and an orthopedist. Often, it is also necessary for PRD to consult a cardiologist, pulmonologist, neurologist, or sometimes a psychotherapist, massage or acupuncture therapist, or a pain specialist. In addition, a PRD may need to consult a disability attorney as well as a pharmacy, laboratory, infusion center and a radiology facility. When appropriate, rheumatology specialists should refer patients to other specialists to ensure their adequate care. Assisting your patient with the process of coordination of care is fundamental to her long-term health. Records and recommendations related to the patient’s rheumatoid disease should be communicated to interested parties, in light of guidelines and known risks for PRD, but it is also critical that a rheumatology specialist include exchanged information in evaluation of a patient’s Rheumatoid Disease. Educate yourself about this disease as much as possible, including allowing patients to educate you about their experiences with it. Bear in mind that not enough is known about RD, so intellectual curiosity is a great advantage. Recognize that information in textbooks may be outdated, incomplete, or mistaken about some aspects of RD. Stay current on peer-reviewed research, and specialty guidelines. Remember that advertisements and drug “reps” present only one point of view of the disease or its treatments. Encourage your patients to be well informed about the disease and its treatments. Be willing to read new research, even when it’s provided to you by patients. Attend scientific meetings such as EULAR and ACR. Read about patient experiences online in public forums such as blogs and social media. Often Rheumatoid Disease activity is not obvious to the naked eye until after permanent damage has occurred or led to deformity. For decades it has been known that x-rays are ineffective for judging disease activity. However, imaging tools such as musculoskeletal ultrasound (MSUS), magnetic resonance imaging (MRI), computed tomography (CT) scans, and nuclear bone scans (scintigraphy) are available to provide more information when clinicians are uncertain of disease activity. In 2006, Brown et al. demonstrated by MSUS and MRI that synovitis is persistent in 96% of patients judged by clinicians to be in clinical remission, based on blood tests and lack of external swelling in their estimation. Studies have continued to provide evidence that MSUS detects disease activity that clinicians otherwise fail to recognize. In 2013, EULAR published ten specific recommendations for the role of imaging in the management of RA. “’You can see raging inflammation in joints that are not swollen or tender,’ he said in an interview. The discrepancy between clinical symptoms and the ultrasound appearance can be ‘surprising,’ said Dr. Kelly, a rheumatologist at Mile End Hospital in Barts Health NHS Trust in London,” who presented a study on MSUS at EULAR in 2013. Cost has prohibited routine use of imaging except MSUS, which is not available to most patients in the U.S. because few are trained to use MSUS for diagnostic purposes. Because of its value not only in detecting disease activity, but also promoting earlier diagnosis, MSUS training should be emphasized in both radiology and rheumatology. In light of growing evidence that Rheumatoid disease activity is not always apparent to the clinician’s eye, patient-reported outcomes should be given significant weight when evaluating Rheumatoid disease activity; patients are typically aware of symptoms that indicate disease activity. Whenever possible, clinicians should seek expert training in diagnostic use of MSUS, or refer their patients to a trusted colleague for MSUS evaluation if disease activity is in doubt. Failure to treat a PRD due to lack of conspicuous external swelling can have devastating consequences. Be aware of symptoms experienced by a particular person with Rheumatoid Disease (PRD). At each visit, inquire about symptoms, without dismissing unexpected or discreet symptoms. Accept a list of current symptoms if submitted by a patient, or an electronic app used by a patient to record symptoms. Since RD is a systemic disease like Lupus or Multiple sclerosis (MS) symptoms may be significantly reflected in various organs or body systems, or the patient’s general health, as well as the musculoskeletal system. Unfortunately, many short descriptions of RD are inadequate, even those obtained from medical textbooks. Numerous misconceptions have persisted even after evidence has disproven them. That RD does not affect the spine. That conspicuous swelling always accompanies disease activity. That all patients flare periodically. In reality, many live in a state of persistent disease activity. That vocal cord involvement is rare in RD. That RD does not usually affect DIP joints. That hands are affected first or worst, or provide a gauge for disease progression. That extra-articular symptoms are uncommon. That fatigue is always a result of side effects, lack of sleep, or response to pain. Like other chronic systemic diseases including Lupus, Multiple Sclerosis, and Type 1 diabetes, Rheumatoid Disease (RD) can require the advice and treatment of multiple medical specialties. People living with Rheumatoid Disease (PRD) manage many symptoms related to the effects of the disease itself, or its common comorbidities. (See also #5 Collaborating with other professionals). Referrals to other clinicians should be made for baseline evaluations according to common susceptibilities for PRD such as eye problems, heart or lung disease, and spine-related problems. As patients report symptoms such as shortness of breath, neuropathy, rashes, vascular abnormalities, digestive problems or pain, falling, dropping things, or issues that concern them, they should be referred to an appropriate specialist for evaluation. There is evidence that both patients and clinicians tend to underestimate risks related to RD that may impact the long-term health of PRD. Early and aggressive treatment has been shown in clinical studies to produce the best outcomes for RA patients. [19, 20] In order for disease activity (DA) to be suppressed aggressively, it must be measured. Treat to target (T2T) is an approach to treating RD that combines aggressive treatment, regular monitoring of DA, and the setting of a goal (the “target.”) T2T is similar to the model of tight control in diabetes, and has been shown in studies to result in lower DA levels, which means less pain, disability, and damage for PRD. According to the TICORA, a pioneering study in T2T in Rheumatoid Arthritis, “Present treatment strategies for rheumatoid arthritis include use of disease-modifying antirheumatic drugs, but a minority of patients achieve a good response.” PRD respond differently to medications, but few experience an immediate or complete response. However, as TICORA and other studies demonstrated, striving for a specific improvement target improves outcomes. Experts agree the ideal target is remission, which experts have defined this way: “the absence of signs and symptoms of significant inflammatory disease activity.” But, remission and “low disease activity” have different definitions according to various DA tools, other than “symptom-free.” In T2T, disease activity is measured, and if it is not improved, the treatment plan is adjusted. An expert international task force recommended that drug therapy be adjusted at least every 3 months until the desired target is reached.